I have been visiting Williamsburg for 50 years. When I was a kid, most of the stories told were about the white men who struggled and took enormous risks in their effort to create an independent country. What our Founding Fathers did was amazing and important. But there are other stories to tell, too. One of the pleasures of each return visit is seeing what new programs have been developed. A change I love? Having the opportunity to learn about all kinds of people who lived in or visited Williamsburg in the 1770s. When I was researching Gunpowder and Tea Cakes: My Journey With Felicity, I visited an exhibit that helped visitors understand the importance of religion and spirituality among black people living in Virginia, enslaved and free. Learning about the religious beliefs of enslaved people is challenging, because they left few artifacts or other records behind. Sometimes sailors brought certain meaningful shells or other items from Africa, and sold them to black people in Virginia. This gentleman talked with me about religion and faith among free blacks and enslaved people. Some became Christians. Others tried to keep in touch with African culture, or perhaps blended the two. …until she learned that she was going to be separated from her child. A real highlight of my visit was attending a program where I learned about the importance of music within the black community—especially in slave quarters. African music helped them feel connected to their homeland. For those who converted to Christianity, singing spirituals gave them hope. Some songs from the time period have lasted. Many songs were private, however, and have not been preserved. It isn’t always easy to interpret difficult topics such as slavery. The relationships among enslaved people, free blacks, and white residents in Colonial Williamsburg were complicated. (Native Americans too! But that’s another story.) I’m grateful to all of the researchers, program planners, and interpreters who today provide a more complete glimpse of Colonial Williamsburg in all its complexity. Everyone’s story is important! Some of what I discovered became things that the main character discovered in Gunpowder and Tea Cakes: My Journey With Felicity. You can learn more on my website. While doing research for Gunpowder and Tea Cakes: My Journey With Felicity, I discovered that a few girls in colonial Williamsburg may have been doing work I once thought was open only to boys. Cool! Certainly, girls were involved in traditional roles. I had the chance to ask interpreters at Colonial Williamsburg questions about cooking, for example. The kitchen at Great Hopes Plantation. And I saw several young women working in a dressmaker’s shop. Milliners specialized in making hats, and mantua-makers stitched gowns and accessories. Like all skilled trades, this work usually required an apprenticeship. An experienced seamstress would hire younger women, and teach them her skills. Colonial Williamsburg has a modern program that allows men and women to become apprentices and learn a specific skill. After learning the basics, apprentices graduate to journeywoman or journeyman status. The most skilled may one day become masters and run a shop. An example of the fashions produced in such a shop. I also saw several women who were apprentices in nontraditional roles. The young woman below was in the 2nd year of a 7-year apprenticeship at a joinery. Joiners produced things like window frames, doors, and shutters. Apprentices usually started at age 14. They had to be tall enough to work at the bench, and spent 12-hour days in the shop. A master craftsman would rule a shop like this. A journeyman, who had some skills but had not finished his or her apprenticeship, would help train the apprentices. An apprentice watches as the master craftsman checks her saw. The man interpreting here told me that he’s not aware of official female tinsmith apprentices in the colonies, but he has seen women mentioned in records—probably all family members who learned the trade from their husband or father. Some of the finished products, ready for sale. “There were women in almost all the trades, if help was needed and they could do the work,” one interpreter told me. 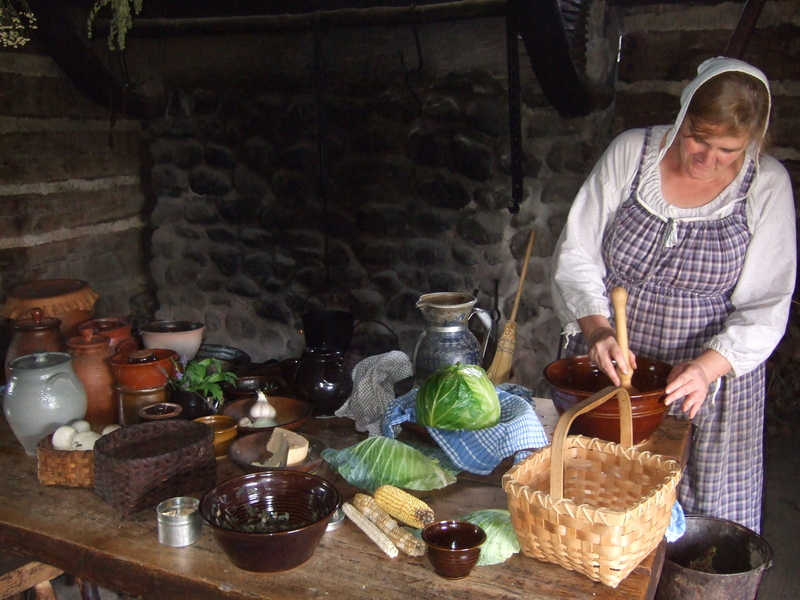 If you had lived in colonial times, would you have wanted to become an apprentice? What skill would you like to learn? Gunpowder and Tea Cakes is my first book about Felicity Merriman, the American Girl character who lives during the Revolutionary War. It also features a modern girl who travels back in time and meets Felicity in her home town of Williamsburg, Virginia. This was a special project. I’ve been visiting Williamsburg for a long time! That’s me proudly wearing a tricorn hat in Williamsburg when I was about six years old. Colonial Williamsburg is a living history museum—the largest in the world! Historians saved many old buildings there and restored them to look as they did in Felicity’s time. Interpreters wearing reproduction clothing help visitors understand what life was like for the people living there over two hundred years ago. Williamsburg was the capital of the Virginia colony. Some of the things that happened there led to the Revolutionary War between Great Britain and the American colonies. After American Girl invited me to write this book, I went back to Colonial Williamsburg to do research. A volunteer soldier who is ready to fight the British argues with a man who wants to work problems out peacefully. This type of program helps visitors understand the conflict. Two riders travel down the Duke of Gloucester Street in front of old homes and shops. The items on the shelves all might have been sold in the Merrimans’ store. An interpreter demonstrating cooking over an open fire. This lady is an expert wigmaker. I especially wanted to learn what life was like for girls like Felicity in the 1770s. Flying a kite on the Duke of Gloucester Street. The type of doll Felicity might have played with. I also paid attention to what kids visiting today were most interested in. A young visitor asks an interpreter a question at the apothecary. Two girls getting into the spirit of colonial life in their pretty hats! As I explored Williamsburg, I started imagining scenes I wanted to write. 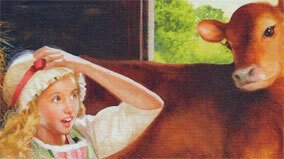 Since Gunpowder and Tea Cakes is a time-travel book, I also imagined how a modern girl might react to everything. And I asked lots and lots of questions. The interpreters I met were great! Before writing the book I did lots of other kinds of research too. But we’re lucky that Colonial Williamsburg exists as a living museum, to help provide just a glimpse of an important time in America’s history. Caroline receives a letter asking her to come and help on Uncle Aaron’s farm. Although she hates to leave her family, Caroline is pleased to see her cousin Lydia—and to meet Lydia’s pretty cow and sweet baby calf! Determined to help out in any way she can, Caroline keeps watch when a thief starts sneaking around the farm. Then she makes an unexpected discovery—and learns that some things are not as simple as they seem. I had a lot of flexibility when developing a plan for Caroline Abbott’s six books, which was great! However, I did try to include familiar themes in Caroline’s stories. Traditionally, the six-book sets created for American Girl’s historical characters have ended with a “Changes” book. I liked the idea of giving Caroline new ways to grow and change, so I decided to take her away—temporarily!—from her beloved Lake Ontario. When the book begins, Caroline receives a summons to help at her cousin Lydia’s brand new family farm. To learn more about farm life in rural New York two hundred years ago, I visited the Pioneer Farm at Genesee Country Village. 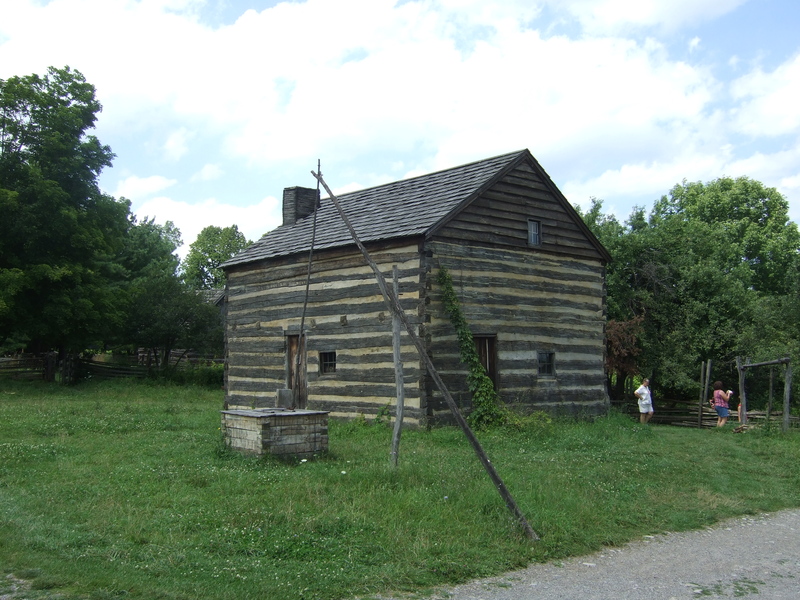 Built in 1809, the Pioneer Farm is presented as it looked about 1820. Since Caroline and Lydia were responsible for kitchen chores, I enjoyed chatting with the interpreter about period cooking and baking. And here’s the garden. 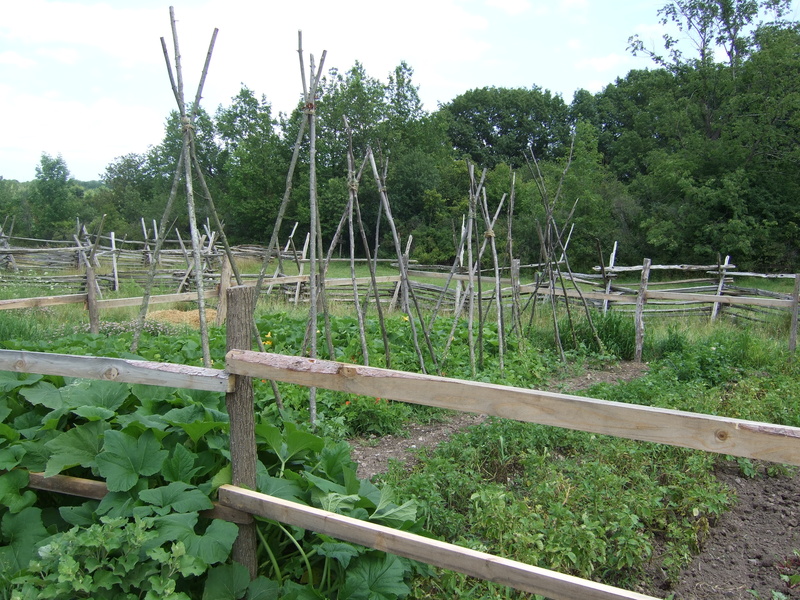 Growing food, and protecting it from pests, was essential to survival. Since I spent twelve years working at Old World Wisconsin, an outdoor museum that includes nine restored farms, I was pretty comfortable writing about farm life. 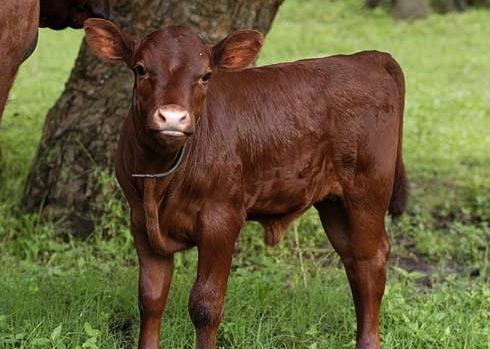 And when my colleagues at American Girl suggested including a calf, I was excited by the opportunity to learn more about old breeds of cattle. Modern farmers tend to raise only a few breeds of cows, pigs, sheep, and other livestock. 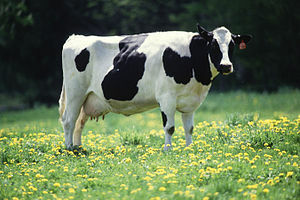 For example, Holstein cows are the most popular on dairy farms today. Holsteins don’t provide the richest milk, but they provide more milk than any other breed. Lots of very old breeds of livestock are in danger of becoming extinct. Historic sites around the world play an important role in saving rare breeds from extinction. To learn more about cattle in Caroline’s era, I looked at the breeds being raised at Colonial Williamsburg in Virginia. (Curious? 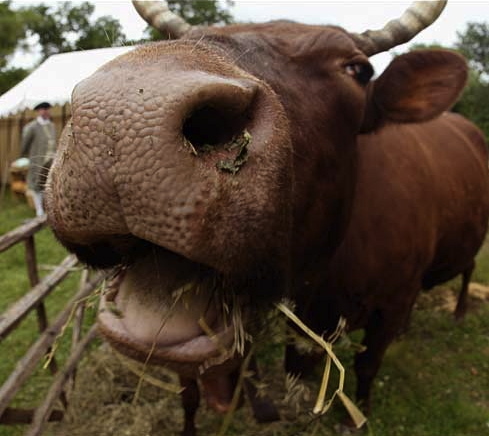 You can learn more about Colonial Williamsburg’s Rare Breeds Program here.) Since that site interprets a period before the War of 1812, I could be confident that the animals they raise were known in the United States in Caroline’s time. I discovered a beautiful breed, American Red Milking Devons. Their rich milk was prized for butter and cheese production. They were easy to care for, intelligent and steady work animals, and provided quality meat. Caroline Abbott isn’t a farm girl, so when she arrives at her cousin’s farm, she’s not sure that she wants to get close to one of these big cows! Then Caroline learns that her job will be tending and training a baby calf. One look, and her heart melts! The photo above provided inspiration for Garnet, the baby calf in Changes For Caroline. Training Garnet wasn’t enough to make a whole story, of course. I needed to create a bigger plotline, something to keep readers turning the pages. While doing my very early research about life for women and girls in 1812, I visited Fort George, a National Historic Site of Canada. I talked with a wonderful interpreter who told me about the children of soldiers who served during the War of 1812, both British and Americans. The interpreter in the enlisted men’s barracks. Although some officers brought their families along to their new postings, only a few wives and children were lucky enough to travel with the “common” soldiers. It was a hard life. 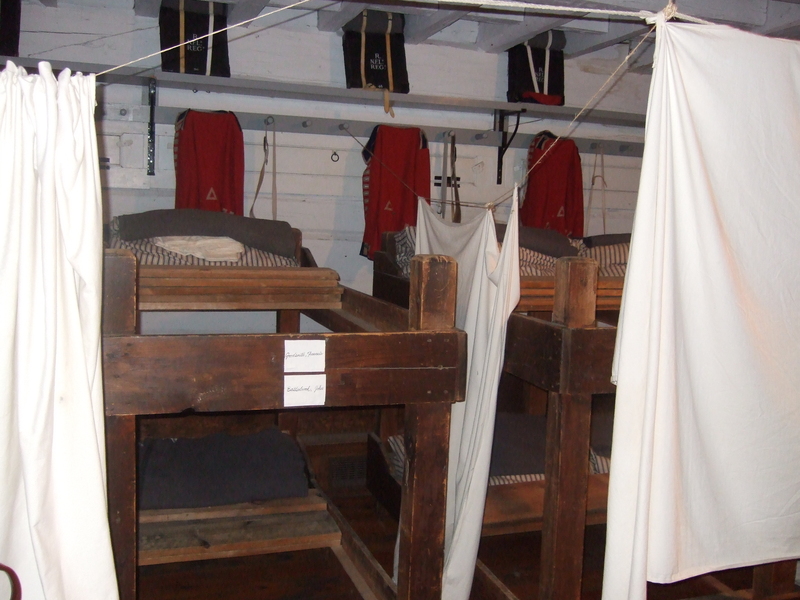 They lived in the barracks, and both women and children were expected to work. Girls helped with cooking and laundry and sewing. Hanging blankets provided a family’s only privacy. Children slept wherever they could find a spot. And if a husband and father was killed in battle, his wife had to either marry another soldier or leave the barracks—perhaps with no other place to go. I was touched by the stories I heard, and wanted to include something about the lives of army children in the Caroline series. Changes for Caroline provided the perfect opportunity. I hope you enjoy reading as Caroline meets new challenges. And I hope you find the final chapter a perfect ending—not just for this book, but for the six-book series.